H-m-m-m! Mach speed some places – not everywhere! The Maytown School Suites’ rental units range from $875 to $1,450 a month and include an array of amenities including assigned parking spaces. TODAY OUTSIDE MOUNTVILLE – Luxury apartment construction (“$3M, 15-unit apartment building under construction near Mountville”) is moving along just behind Scoops just outside Mountville. SOMETIME IN COLUMBIA? – “Developers plan building in Columbia Borough for millennials” – announced in an Lancaster Online article December, 2017 and re-posted to the Borough Website. The borough council minutes for December and January meetings are now posted. 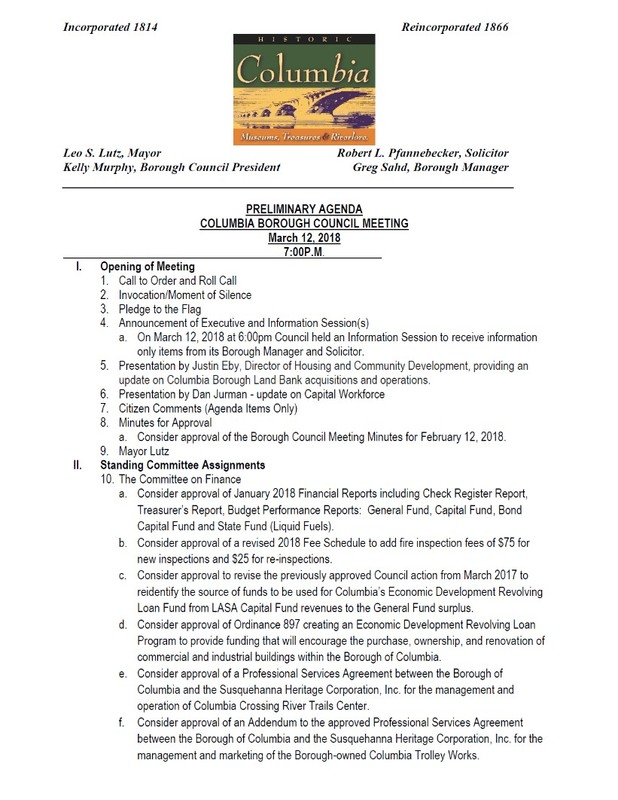 … but at 4:24 pm today, the agenda for the Borough Council meeting that’ll supposed to be held Monday (7:00 pm – 11:00 pm, March 12, 2018 – Borough Council Meeting) IS YET NOT POSTED. but at 4:52 today, the agenda is posted. 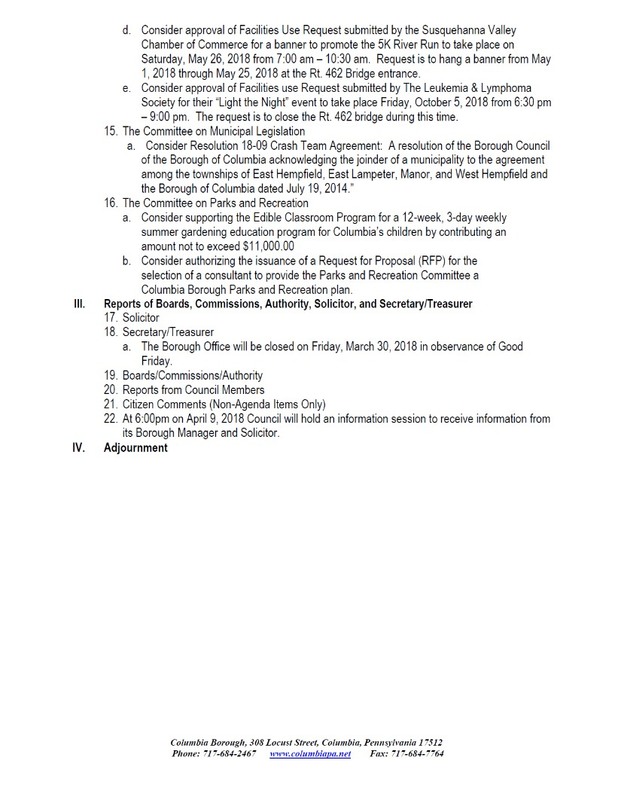 Click here to download: 3-12-18-preliminary-borough-council-meeting-agenda . So there you go Brian. Minutes posted. Borough closes at 5 pm. Hadn’t realized we were to meet a 424 pm deadline imposed by you. 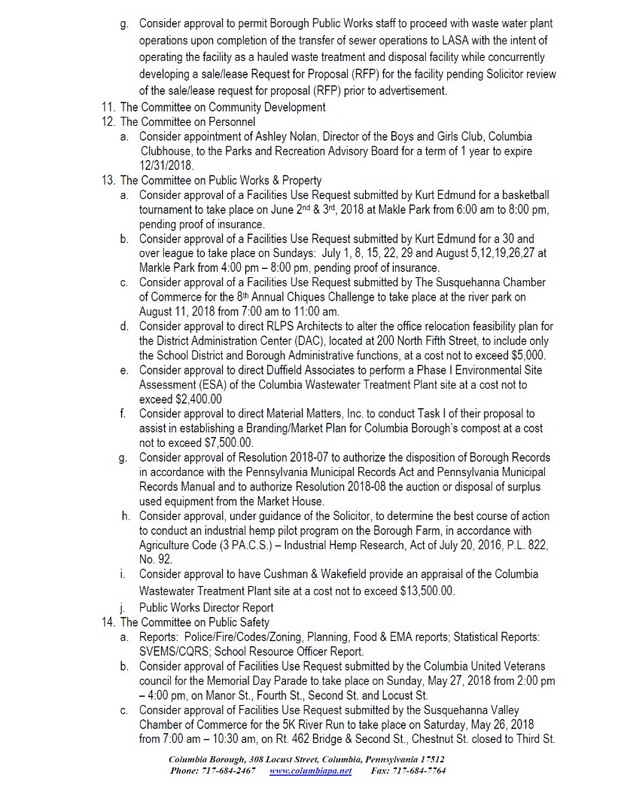 In an article dated April 20, 2016, Council President Kelly Murphy said agendas will be developed and finalized by Thursday or Friday of the week immediately prior to a borough council meeting and to have that agenda posted on the borough’s website, along with the documents which are to be approved or discussed pursuant to that agenda. A resident asked if a hard copy would be available the same day it is posted on the website and Murphy said a printed agenda would be available. [Borough offices close at 4:30 pm].